Scientific interest in zingiber was aroused during the 1980s and early 1990s based on traditional herbal usage for arthritis and migraine (Srivastava and Mustafa, 1989 and 1992; Mustafa and Srivastava, 1990). Authors speculated that activity was due to inhibition of the enzyme cyclo-oxygenase, with an action similar to aspirin. Note that Bloyer describes fever-lowering properties for ginger. 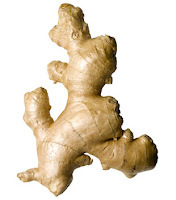 Inhibition of cyclo-oxygenase, as well as modification of other mediators of inflammation has been demonstrated with the use of ginger or its constituents in animal trials. A study of fifty-six patients with rheumatoid arthritis, osteoarthritis, or muscular discomfort showed that three to seven grams of powdered ginger a day was effective in reducing pain, discomfort, and swelling. Twenty-eight patients had rheumatoid arthritis, eighteen had osteoarthritis, and ten had muscular discomfort. The researchers were investigating reports from Ayurvedic and Unani Tibb medicine that ginger was useful in inflammatory diseases. Among the arthritis patients, more than three-quarters experienced varying degrees of relief in pain and swelling. All the patients with muscular discomfort experienced relief in pain. None of the patients reported adverse effects during the period of ginger consumption, which ranged from three to thirty months. The researchers speculate that ginger acts through inhibition of prostaglandin and leukotriene synthesis. We don?t usually report on brief research articles on our front page. We've made this exception because of the tremendous potential health benefits of this research. More than two hundred pharmaceutical drugs ranging from non-steroidal anti-inflammatory drugs (NSAID), corticosteroids, gold salts, disease modifying anti-rheumatic drugs, methotrexate, and cyclosporine are used to treat arthritis. Not one of the drugs has been found safe; all produce mild to serious side-effects, and NSAID cause more than ten thousand fatalities a year in the U.S. alone from gastrointestinal bleeding, according to the Food and Drug Administration. Ginger, on the other hand, is "generally regarded as safe" by the FDA for consumption as food. This study, of course, calls for larger controlled trials before the efficacy of ginger is proven to the satisfaction of public health regulators. Don?t wait for that to prescribe it for your patients who have arthritis or who are on anti-arthritic drugs. Your patient will let you know soon enough if it is not effective. Even if it is only partially effective it may help patients reduce the dosage or the frequency of the more dangerous medications. Furthermore, the warming effects of ginger may help prevent injury to the gut wall by the NSAID. The only contraindication we know of to doses of ginger in this range, as taught in Traditional Chinese Medicine, is pregnancy. However, lower doses, one gram a day and under, have been found both safe and effective for morning sickness.